Men’s soccer fell to John Jay College, 4-3, on Wednesday evening. The Dolphins lose against the John Jay Bloodhounds was both a mental and physical game that brought the College of Staten Island men’s soccer team to a record of 2-2-0 in the CUNY conference. Staten Island got off to a slow start when in the 4th minute John Jay’s Nermin Kurtesi put the ball in the net off an assist from Justin Orsino. While Staten Island was dominating the game, they had trouble finding the net. On the opposite end, another goal was scored in the 20th minute by Yotam Bloom. However, starting with Nedgy Nazon, the game was turned around with a goal in the 25th minute off of a corner kick by Brandon Cadmen. Around ten minutes later, Daniel Tsygankov followed Nazon’s goal with an assist from Nazon himself. It was not until the 41st minute that Nazon scored a second goal that John Jay’s fire was fueled in a physical direction. 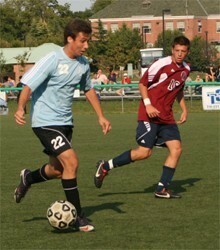 It soon didn’t become a game about soccer, but Staten Island tried to stay focused on their lead. In the 74th minute, the first yellow card was served to John Jay for a foul in the mid-field. In between the first and second yellow card that was served in the 85th minute to both John Jay’s Kardon Bartley and Staten Island’s Ahmed El-Ghareib, John Jay put in their 3rd goal to tie the game. Two more yellow cards were distributed to each team for unnecessary fouls. Both teams were determined to win the game and John Jay came out with the victory. The unassisted goal was scored in the 87th minute by Kareem Roberts to take the lead. While Staten Island was trying with all their might to get another goal, John Jay was defending their lead. The teams’ chemistry just didn’t mix in this match and Staten Island player Alfonso Castaneda was sent off the field with 3 seconds left in the game for receiving a red card. That last moment of the match is a good summary of the whole games mental and physical states. CSI will host Hunter College on Saturday, October 6, at 2:00 pm as part of CSI’s Homecoming event.